With equal ease and satisfaction, I have given workshops to special-needs pre-schoolers and top level leadership at NASA. Creativity on tap, developing programs, and guiding participants through an experience to a new place are core magics in my bag of tricks. That’s me with a piece of cardboard strapped to my head. it doesn’t take much to be creative. And .. IT'S FUN, and fun is important. The first session will be a group call, MARCH 2 at 2:30 pm. We will meet one another, dive deep into what this course is about, look into some of the tools and materials, and most importantly, we will look at all the sneaky ways that resistance shows up in our lives and keeps us from doing the things like nurturing our creativity. This call alone is super useful beyond this course. It will help you spotlight the covert ways your mind sabotages you. Don’t feel bad, this sabotage happens to EVERYONE. You will get carefully crafted fun and doable daily exercises, inspiration, explorations, prompts, sent to your inbox bright and early every morning. There will be community of like-hearted people creating in a judgement-free, supportive and fun online group where we can share our daily explorations of Creative Mojo. Share your creation in our supportive, respectful, private online group. Acquire a few supplies before the course starts. A list will be sent out with links to easy ways to buy these inexpensive items. Whether your creativity is buried under a boulder or free flowing, this exploration has something for you. NEXT COURSE BEGINS EARLY 2019, JUMP ON THE MAILING LIST TO FIND OUT WHEN. 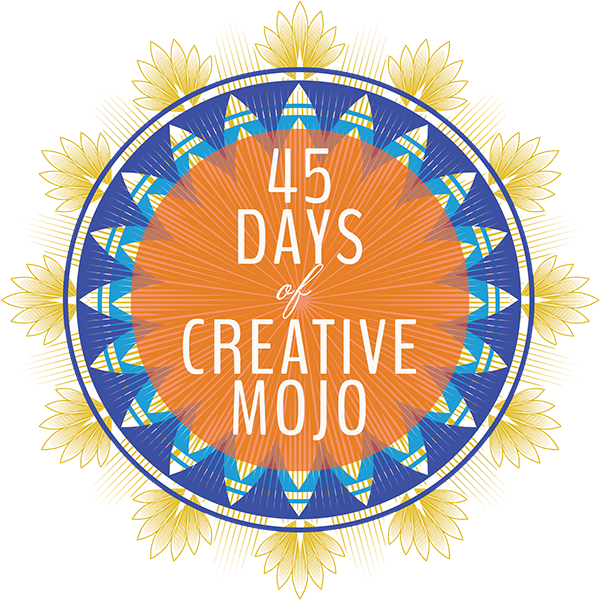 This video shows the work from the 2018 Creative Mojo participants ..
Sign Up for your Mojo Magic Ride or Sign-Up with Friends!